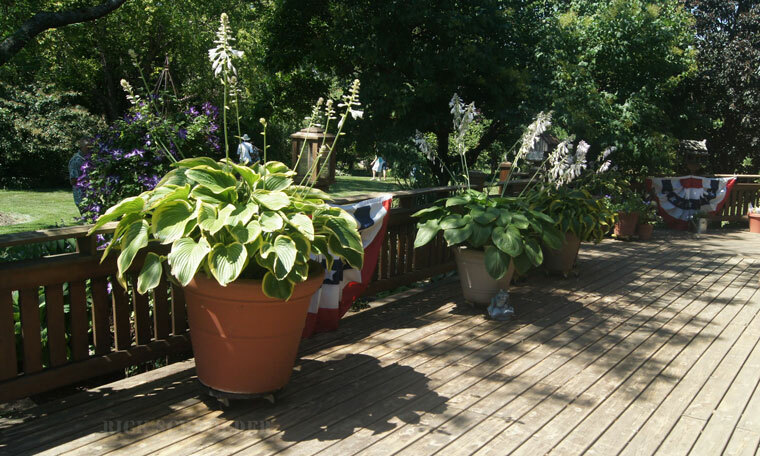 Mother Nature smiled on Lisle, Illinois, July 12-13 as “Hosta Mania” began. Perfect weather greeted the 150 registrants to the 2013 Midwest Regional Hosta Society convention, held at the Hilton Hotel in Lisle/Naperville. Hotel accommodations were superb – nice rooms, good food, friendly servers, and plenty of centrally located convention space. Nine vendors occupied a room large enough to display all their wares. Hosta favorites plus ones newly on the market, Japanese maples, and concrete stepping stones, along with hosta-print vests and fairy gardens made their way from the vendor room to nearby car trunks. Oh, what a Ball! On Friday morning, the convention committee had arranged an optional tour of The Gardens at Ball. This was not just row after row of plants, but instead, acres of beautifully landscaped areas, showcasing new varieties of plants. An hour long guided tour provided a glimpse of the many types of seed trials underway. 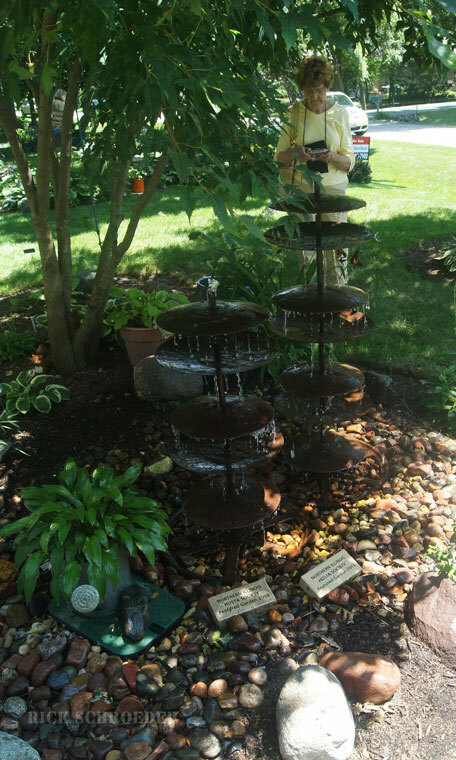 Some areas were dedicated to sunny annuals and perennials, while others displayed colorful shady alternatives. The many types of new coleus caught my eye. A favorite of our tour group was the ‘’living wall.’’ One wall, made of wooly pockets, held shade plants. Another tall frame held vertically positioned trays of sun plants. There was plenty of time after the tour to wander the grounds, taking a longer look at the ornamentals and vegetables we will see in our local nurseries in the coming years. What an inspiring way to start a garden convention! Ten members opened their gardens to visitors on Friday and Saturday. Each garden had its own identity. 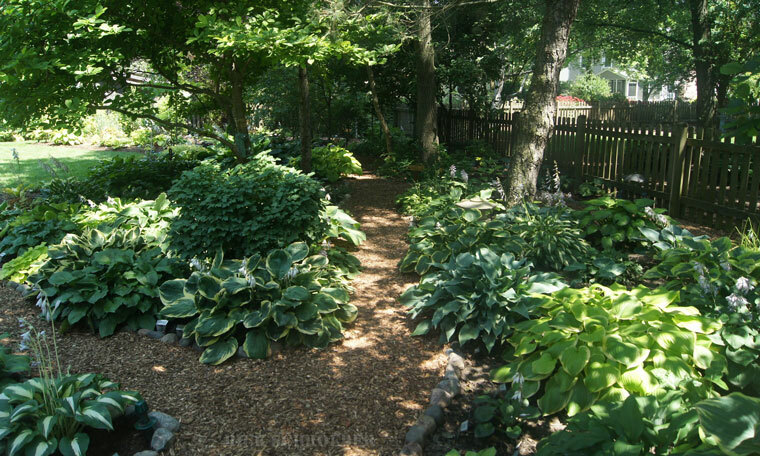 Some yards were meticulously groomed, with not a damaged hosta leaf in view. 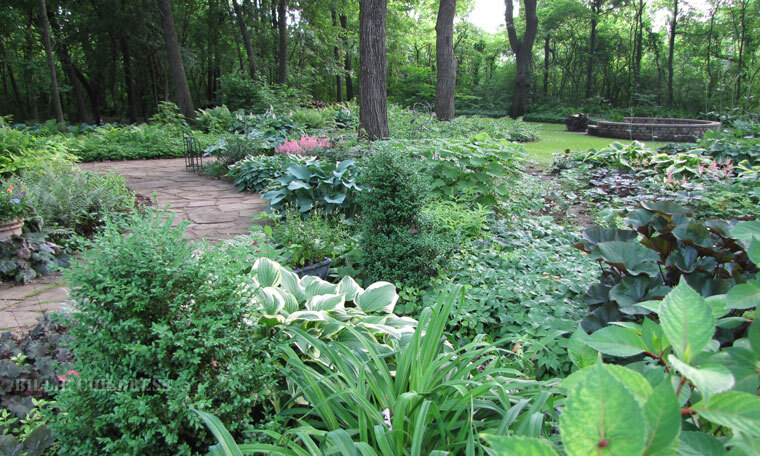 Others promoted a more natural look, with native plants poking their heads amongst the hostas. 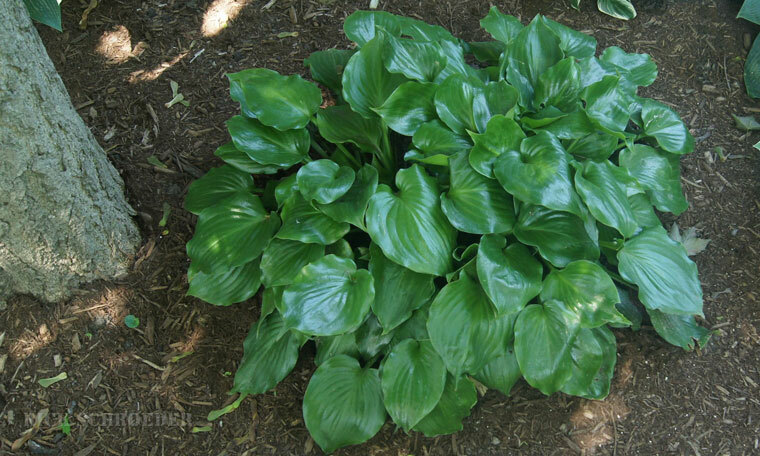 Large, beautifully grown hostas thrived in abundance. Fairies danced in troughs. 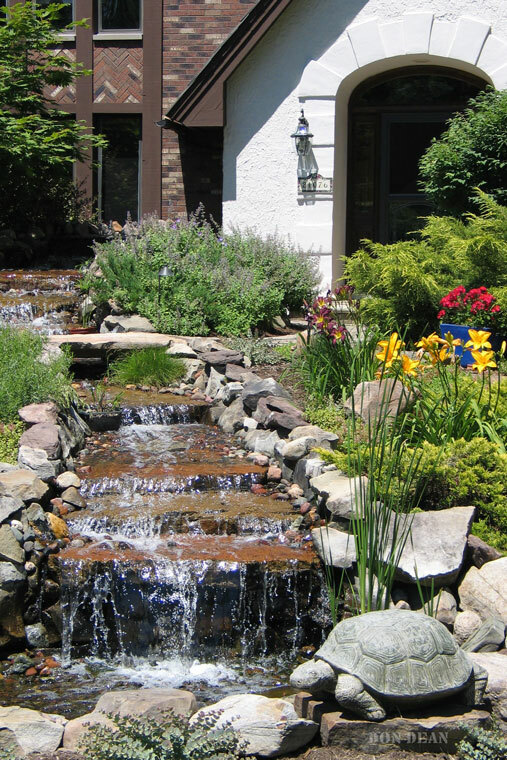 The soothing sounds of water greeted conventioneers: waterfalls, meandering streams, ponds streaked with the gold of swimming fish, water splashing down a rock tower, and many bubbling fountains. Tall giraffes nibbled at tree leaves; a cheetah crawled down a dead tree; and black ducks quacked in their pen, while a rooster crowed in the distance. 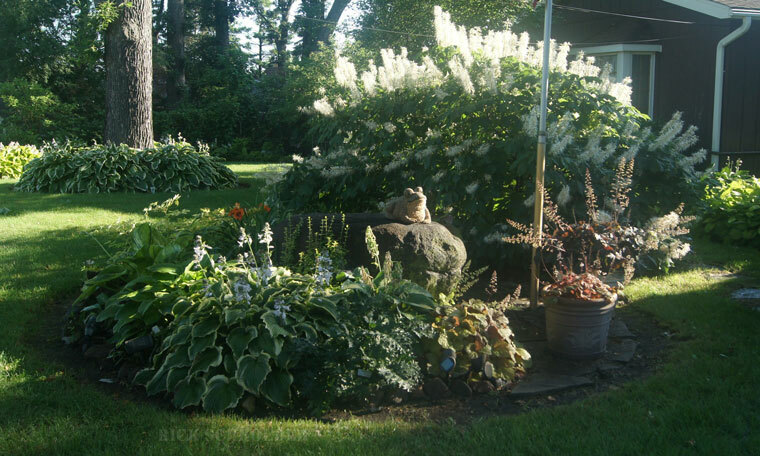 Stands of hydrangeas, ligularias, and golden grasses, patches of sun-loving daisies, and coneflowers, even a butterbur, dotted garden beds and borders. Majestic oaks, walnuts, and hickories provided the high canopy hostas so love. Beautiful tri-color beeches brightened many a landscape. We came for the gardens and were not disappointed. For the first time, the MRHS convention used a drive-yourself concept, instead of buses, to travel to the various gardens. Conventioneers were given annotated maps with driving instructions to each location. Many members used their own GPS systems. Attendees who chose not to drive were matched with others willing to have a passenger or two. The system was a huge success. This method allowed people to visit the gardens in any order and spend as much time in each, as they wished. 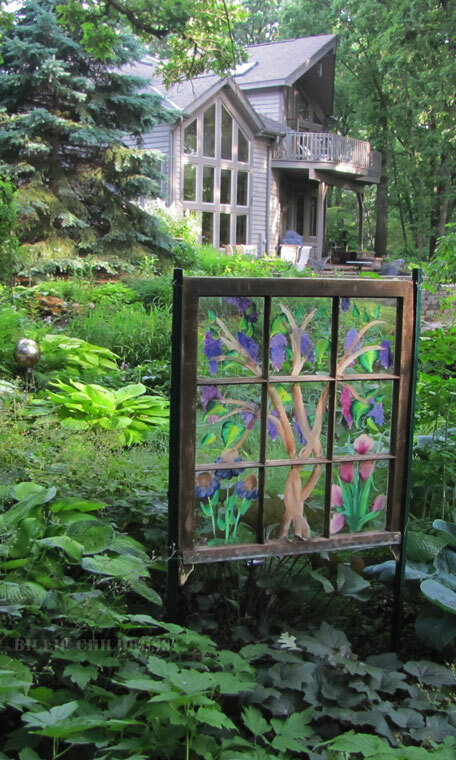 Since hosts were not overwhelmed with an influx of fifty people at a time, they were able to present their beautiful gardens in a leisurely manner. There was still plenty of time for the camaraderie that buses provide during the cocktail hours, dinners, and at hostatality. Friday afternoon seminars featured talks by Tom Micheletti and Mary Ann Metz. 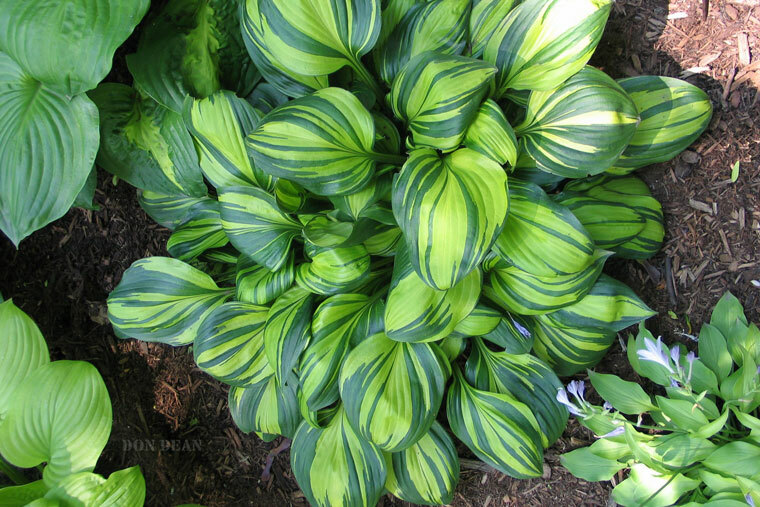 Tom began with a bit of hosta history, followed by a discussion of different hosta sizes and color variations. 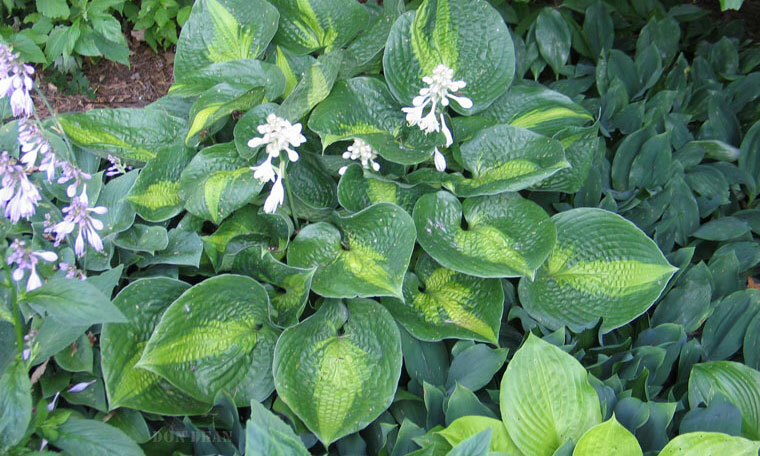 He showed how the hosta, with its range of foliage color and texture, can be incorporated into our landscape. Tom then switched to his main topic of hosta maintenance, by giving tips on plant division, fertilizing, diseases, and pest control. 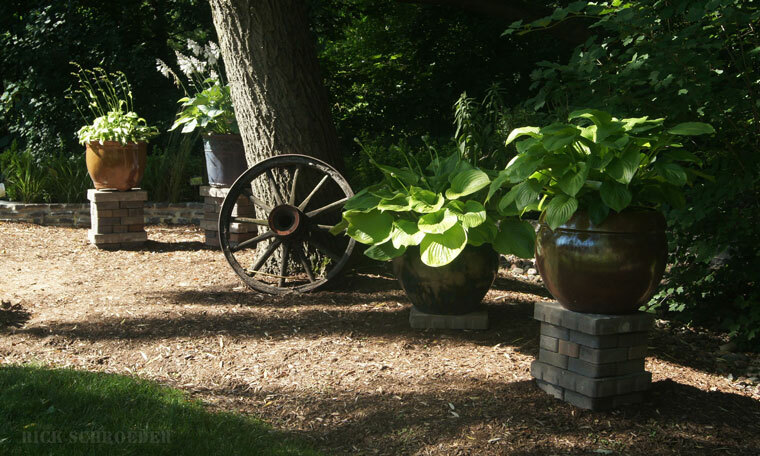 Mary Ann Metz expanded on the theme of landscaping with hostas. 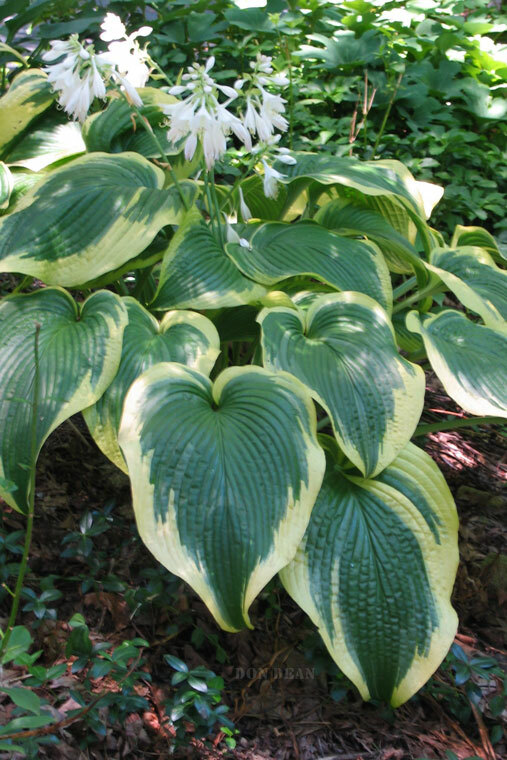 She contended that the hosta is a great landscaping plant, which combines the three elements of design: color, form, and texture. 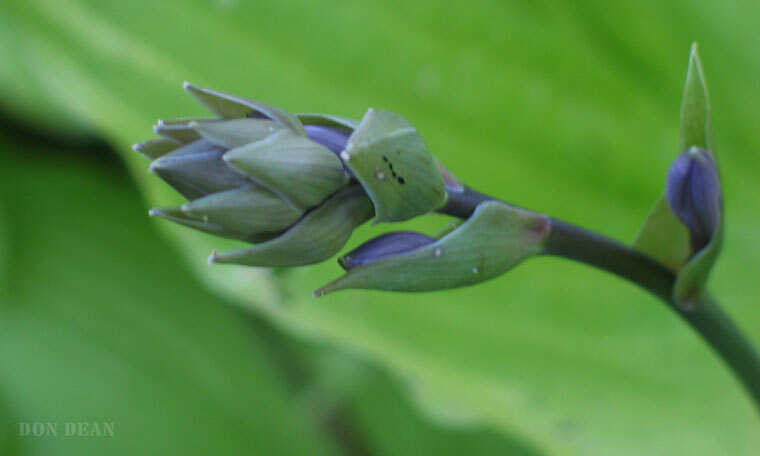 Mary Ann discussed these elements in more depth, using hosta pictures to demonstrate her points. One of the highlights of a hosta convention is the Leaf Show. Row after row of glass bottles held leaves in a vast array of sizes and colors. Along one wall stood themed arrangements using hosta leaves; along another, were container plantings. Viewing these perfect specimens, we appreciate how much work there is to find a leaf with no damage, transport it to the hotel, then clean and prep it for display. Friday evening’s live auction was tense, as bidders vied for that special plant to add to their gardens or breeding programs. 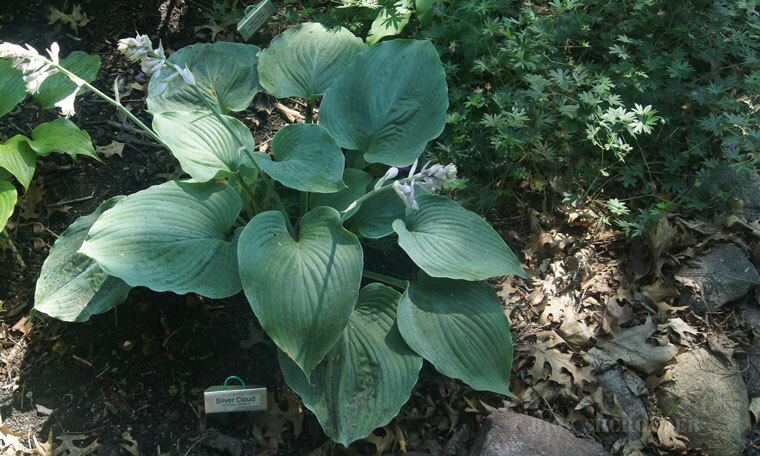 Especially coveted was Trudy and Bruce Van Wyk’s Hosta ‘Emperor’s Dragon’. The popularity of “steakers” continues, with many unusual donations fetching high bids. Award presentations highlighted the Saturday night banquet. The DeEtta Montgomery Award for outstanding service to MRHS was presented to a very deserving and much loved member, Carolyn Hamilton. A newcomer on the leaf show scene swept those awards. Among numerous other ribbons, Rita Gindt-Marvig won the coveted Best of Show. The two days flew by in a flash. It was soon time to bid adieu to old and newly acquired friends. 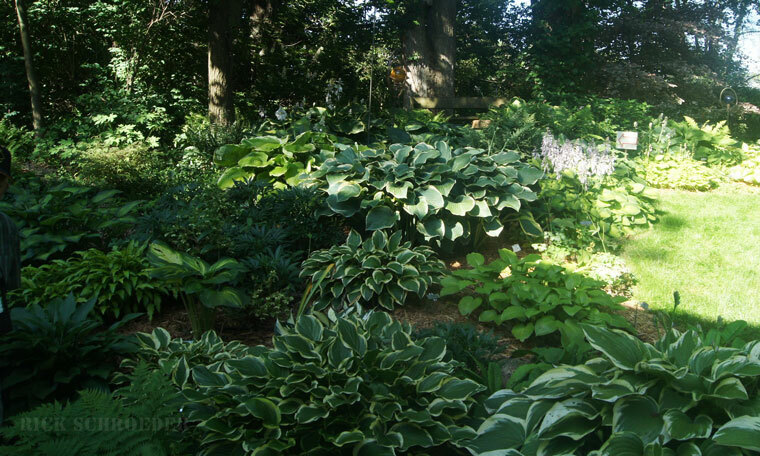 Many thanks to Barbara King, her committee, and the Northern Illinois Hosta Society for a well-run, thoroughly enjoyable event. 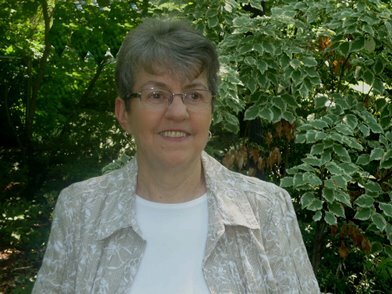 New Author Bio - Joan Poos, a retired computer software analyst, started her interest in The Friendship Plant when a friend advised her in 2001 that the problems she had with grass under large oaks could be resolved with plantings of hosta. 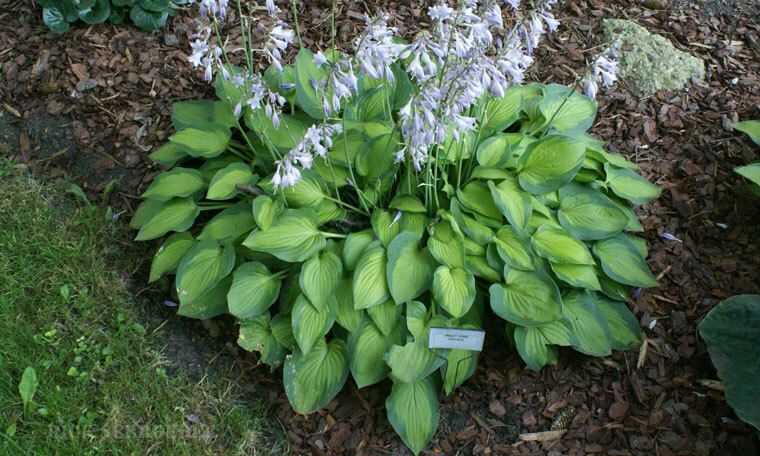 The original purchase of eleven hostas has now expanded to over 750 varieties. 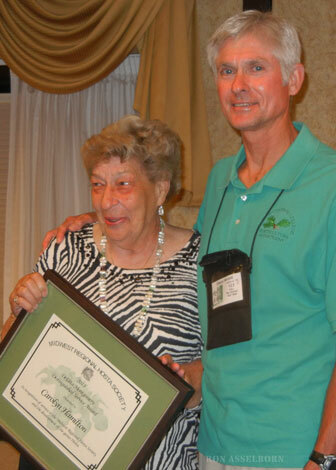 Active in the local St. Louis Hosta Society, she has been SLHS’ newsletter editor since 2008. 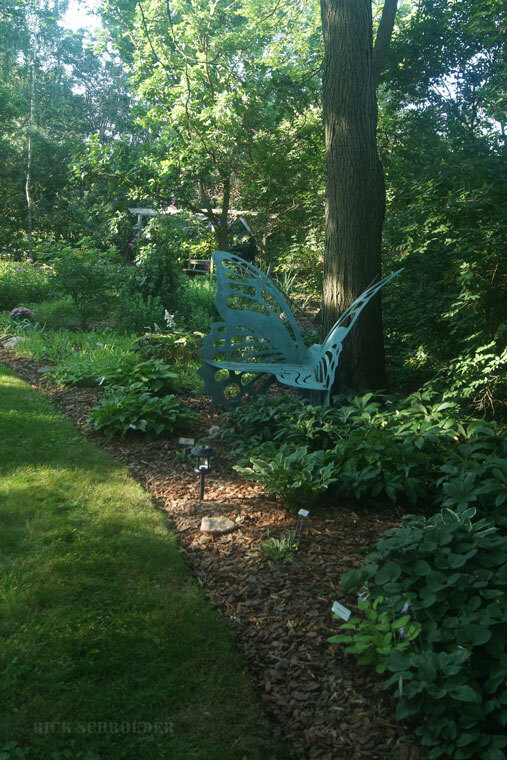 Her garden was part of the 2008 AHS National Convention in St. Louis, multiple daylily conventions, and has been featured in national and regional magazines.